Five weeks after signing the investment contract with FARO Technologies we show our newest VR-Suite version at CEBIT with newest equipment. 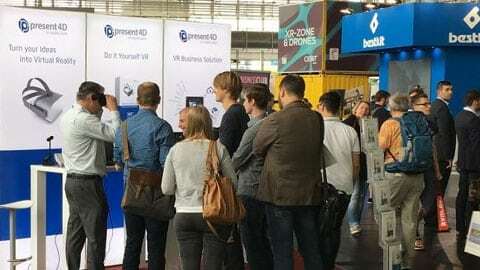 This year we have an even larger crowd than at the very successful CEBIT 2017 – that’s absolutely fantastic. We thank all our customers for their encouragement and the countless interesting discussions and ideas we have exchanged! A big thank you! A big ‘thank you’ also to Facebook, Oculus and the VR Business Club to offer us the opportunity to present our ideas on their stage. And finally thanks to HTC VIVE for giving us a personal presentation of their new Vive Focus!